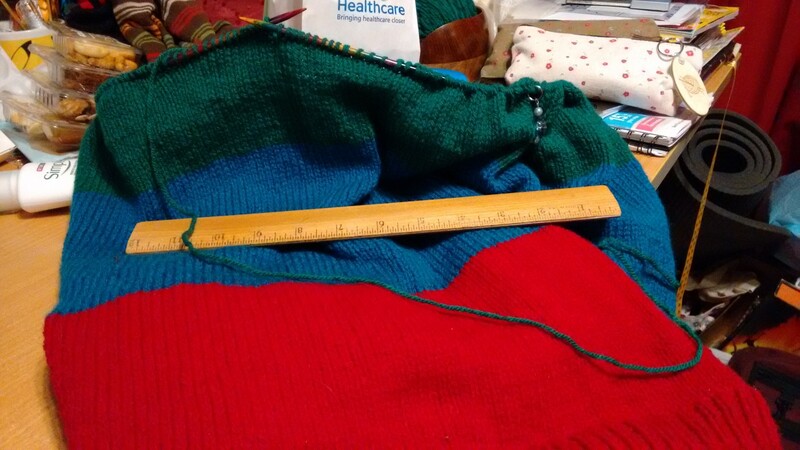 The next point that I have to think about doing anything on this jumper is at 3 and 3/4 inches — 3.75, if you will. It’s currently at just about 3 inches; I should probably try to estimate how many rows more I need to go. I also need to remember that when I do the increase that the pattern calls for that I space it slightly different so I have less chance of a gap. Nothing says boo like a tiny gap in a garment meant to be warm. Littler had her last set of tinyperson vaccines today, and she was a champ. She didn’t shed a tear or grimace or whine — she smiled through both of them. In fact, the only time she cried was when she shocked herself by slipping on a bit of slush on the way home. It’s probably my fault — I was trying to navigate us to a spot that would allow a woman with a pram to go by, and might have pulled her faster than we had previously been going. I picked her up and got her sorted out though, and she was able to assuage herself with a bit of cake she brought home from school. It was because of the aforementioned that I was glad that the girls’ school was open. The surgery is on the way home from school, so it made the day feel a bit more organised. And, also, Smalls had an after-school appointment as well, though Z fielded that one. So that worked out pretty well, even if the lazy part of me last night was hoping for closure so I wouldn’t have to get dressed. I would have had to anyways, so. *chuckles* On the whole, I’m glad that I could be of help and carry some of the weight for Z by being able to handle Littler’s thing. Anyawys, I guess those are the main things. Tomorrow is for work, not dealing with people for a few hours, and wondering how Hermes is going to fail to knock on my door for the nth time — when I’m in the damned house listening for it. I used to think well of Hermes, but right now? It’s making Yodel look good, and I never thought I’d see the day another delivery service was so poor as for that to be the case.